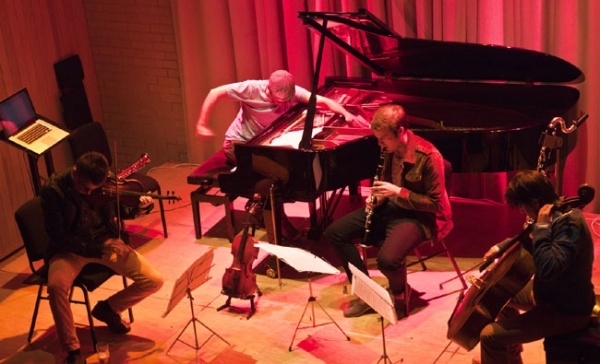 The RADAR Concert Series was created by Mercury Quartet at London’s trendy and intimate The Forge Club in Camden and represents the ensemble’s aim for discovering and showcasing the most exciting emerging composers alongside masterworks of the 20th and 21st century. This season, each concert will represent the music form the quartet member’s own origins: England – Harry Cameron-Penny (clarinet) and Colin Alexander (cello), Romania – Vlad Maistorovici (violin), France and Switzerland – Antoine Françoise (piano). 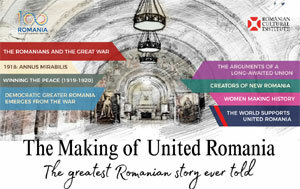 The Romanian Cultural Institute is proud to present the “Romanian Spotlight” within the series, which brings under the “radar” famous Romanian contemporary composers such as Dan Dediu, Doina Rotaru and Ştefan Niculescu, together with young and promising British composers Oliver Weeks and Julian Anderson. The award-winning Mercury Quartet comprises four rising stars of the UK's contemporary music scene: Vlad Maistorovici (violin), Harry Cameron-Penny (clarinet), Colin Alexander (cello) and Antoine Françoise (piano). Performing either as a quartet or alongside internationally renowned guest artists, they perform classic works of the 20th century alongside improvisations, live compositions, new commissions and unknown masterpieces. Recent projects have included the recording of their Debut CD on the Non-Classical label, and performances of Schoenberg's Pierrot Lunaire with Julian Jacobson (London/O ford) and Linda Hirst (Dartington) and Elliot Carter's Triple Duo in London, Dartington, Oxford and France. Recently they worked with Israeli composer Nimrod Katzir, premiering his recent composition 'AZZA' in Switzerland. They have also recorded for and broadcast on the Swiss station 'Radio de la Suisse Romande' and were invited to appear and perform on BBC Radio 3's 'In Tune' show. The Mercury Quartet was formed at the Royal College of Music (RCM) to realise a shared passion for Messiaen's Quartet for the End of Time. They have performed across the UK and abroad, including the Jacqueline Du Pré Music Building, Holywell Music Rooms, Sheldonian Theatre (Oxford), St. Martin-in-the-Fields, St James's Piccadilly, The National Gallery (London), The Great Hall (Dartington), as guest artists at the Dinan Conservatoire de Musique (France) and at Festival des Jardins Musicaux (Cernier, Switzerland). They also won a place as artists to be represented by Concordia Foundation in 2007. The Quartet have appeared as artists in such festivals as 'The Chelsea Schubert Festival' (2008), 'The Rosemary Branch Festival' (2009), 'The Vienna City of Dreams' Philharmonia and Esa-Pekka Salonen Festival (2009) and Dartington International Summer School (2010). The Quartet's commitment to contemporary music has seen them give workshops and premiere many different pieces. In 2009 they visited Kings College London to work with and perform the compositions of the Doctorate students of George Benjamin and in the Summer of 2010 they were resident artists at Dartington International Summer School where they workshopped and performed the compositions of Julian Anderson's advance composition class, as well as coaching a student ensemble on Pierrot Lunaire. Tickets: £9/7 online HERE, £10/8 on the door.